Almost one year to the day that sweet Baby Joshua, who had been struggling with a congenital heart defect, lost his life to post-circumcision blood loss and heart failure, another little one clings to life in a horrifyingly similar experience. 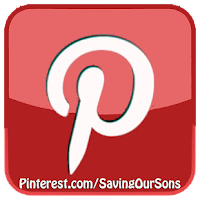 In the United States today, more baby boys die each year from circumcision than from choking, from auto accidents, from suffocation, from SIDS, from (recalled) sleep positioners and from (the newly banned) drop-side cribs. The risk of complications, including death, are monumentally heightened for premature babies, or those born with pre-existing health conditions, including heart defects. 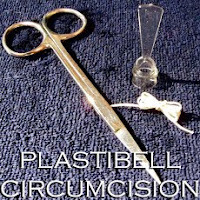 Babies should never be circumcised without full pain relief (anesthesia just as we'd give an adult undergoing genital cutting, reduction or amputation surgery). Anesthesia is counter-indicated for infants and not recommended for newborn babies (any drugs in a baby's body increases risks to health and wellbeing). No baby already facing pre-existing medical concerns or health compromises of any nature should be circumcised. 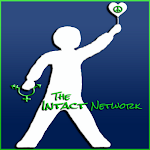 (Genital cutting is risky for even healthy babies - and carries with it detrimental consequences - the foremost of which is the loss of a healthy, vital, functioning organ: the prepuce. 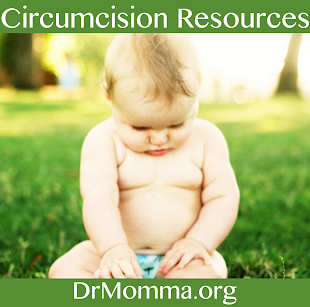 Circumcision is exponentially riskier for premature or health-compromised infants). What follows is one authors' write-up of Baby Chance's story for the Herald Citizen, a Cooksville, TN newspaper in the same city Chance was born. Chance was luckier than Joshua was - both were forced into similar genital cutting stress and complications on their already fragile hearts, but Chance had a physician nearby who administered a prostaglandin that artificially kept his heart going until further surgical interventions could take place. 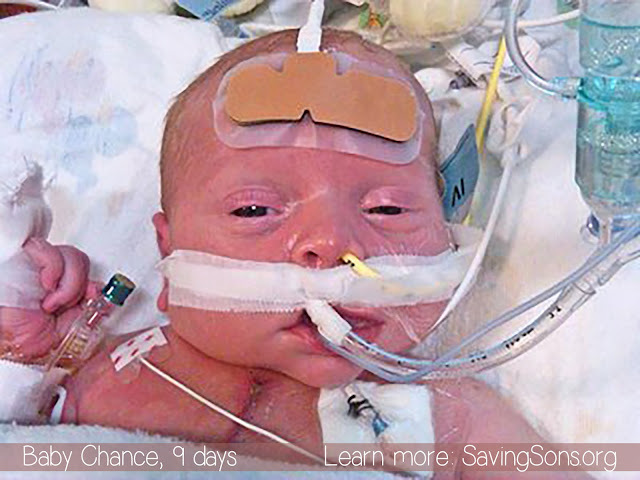 Just 9 days old, Chance endured his first open heart surgery. One-year-old Chance Bond's bright, curious eyes and smile light up a room and give no indication that he struggles with a very serious health condition. Amanda Bond had just had a tubal ligation reversal three weeks before she found out that she was expecting her third child. "I wasn't supposed to (get pregnant) until six weeks (after)," Bond said. The pregnancy was "bad" from the beginning, she says. She'd had at least 20 ultrasounds during the pregnancy. "We had no clue that he had something going on with him," she said. According to Bond, the chances of reaching a full-term pregnancy with the baby were slim. However, at 38 weeks, Chance was born at Cookeville Regional Medical Center. He was a typical, healthy baby. Everything was fine until he had a circumcision the following day. "About 15 minutes after they circumcised him, he crashed," Bond said. "Luckily, we had someone here that knew what was going on and saved his life." That someone was Dr. Apryl Hall, Pediatrics-Hospitalist, and the staff of the unit. Dr. Hall administered a prostaglandin which kept a key valve open in Chance's heart, in order to save his life. "They saved his life," Bond said. "To be on it that quick is a big deal." According to Bond, Chance's condition -- hypoplastic left heart syndrome -- should have been picked up on one of the many ultrasounds but wasn't. Typically, this condition occurs when parts of the left side of the heart -- mitral valve, left ventricle, aortic valve, and aorta -- do not develop completely resulting parts of the heart being undetected with an ultrasound. "Because he had four chambers, they didn't pick it up," she said. "But he didn't have four chambers that were going to work correctly." The left side of his heart wasn't large enough to function on it's own requiring, to date, two open heart surgeries and a regimen of medications to make his heart pump stronger keep his blood pressure and heart rate in check. Oxygen saturations in a typical heart are anywhere from 95-100 percent. In his case, it's 75-85 percent. There will be a third surgery, typically, between the age of 18-24 months of age. Through Chance's ordeal, Bond is hoping to create awareness for his condition and educate people about the seriousness of congenital heart defects. "One out of 100 babies are going to have something wrong with their heart," Bond said. "Whether it's minor, or severe like his." So, Bond created Chances for Scarred Little Hearts in an effort to bring awareness to congenital heart defects and provide information to people about the seriousness of this condition. The group is currently working on receiving its non-profit certification and recently held a blood drive and achieved 100% of their goal for the organization. According to Bond, laws that will require pulse oximetry screening of all newborns have passed the Tennessee Senate. There have been no recent updates on the Tennessee General Assembly website regarding activity for the same bill from the House. Bond says that a similar bill is being reviewed on a federal level to mandate all states require "pulse ox" screenings on all newborns. There is the potential that Chance will have more surgeries as he gets older. "You don't know what the future's going to hold," Bond said.